bienleindesign has no other items for sale. Michael Thurmond of television's 'Extreme Makeover' explains his scientific approach to eating, the 'blueprinting system, ' which identifies a person's unique metabolism and body type and which foods will trigger the body to shed pounds - Provided by thepublisher Television fitness and makeover guru Michael Thurmond delivers a proven program that allows you to eat more, exercise less, and shed as much as 10 pounds in just six days. Lightning fast weight loss is now a reality with THE6-DAY BODY MAKEOVER. The secret to Thurmond's rapid fat-loss formula is customization. By customizing a diet regimen to an individual's unique body type and metabolism, the program delivers dramatic results, making it easy for virtually anyone to lose a whole dress or pant size in just six days. Thurmond's exclusive 'blueprinting system' helps you identify your individual body type so that you can select just the right foods in the right combination to trigger rapid fat loss. With customized meal plans, menus and recipes, fat burning exercise secrets, a maintenance plan, and more, readers will be amazed at the difference six days can make. Sales tax may apply when shipping to: IA*, MI (6.0%), MN*, WA*. 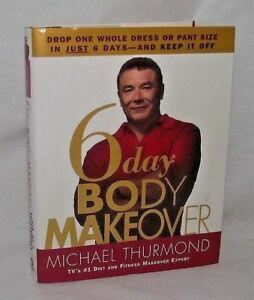 6 Day Body Makeover by Michael Thurmond was recommend by a friend of mine that has transformed her body. I bought the book and if you are ready to really lose some weight fast and in a healthy way ... then easy to follow. Just take it one day at a time!! One meal at a time and be organized. His directions are clear and simple and his 6 day makeover is a great jump start. He tells you based on your body type what to eat, how often and what kind of exercise to do inorder to get the results you are looking for. You really have to be ready because you have to buy foods that (at least for me) were not on my normal everyday eating list like fish and broccoli. I lost about 14 lbs in 7 days (which is probably more than average)and have keep it off even during a out of state move. I will say I felt like I ate way too much and had a hard time eating all the food required on this makeover especially drinking all that water. This is a great book to start yourself in the right direction if you have some weight to lose fast for a special occasion. I will buy his 6 week program next. It worked for me!!!! The information provided in the book is very helpful. It's amazing how he pin points your body type. It takes a lot of planning for the meals, and it seems like you are eating the same foods for every meal of the day, which can get old by day three, let alone day six. I did take the challenge and lost 4 lbs in three days, put couldn't make myself eat another bite of fish or turkey patties. If you have the drive, this is the book for you, and it will work. Another down fall is that he wants you to live this life style, but doesn't provide you with more information after your sixth day. I have purchased this book to learn how to eat healthy and make it a part of my everyday lifestyle The book has taught me just that. To me it is not really about following the diet in the book. If is a wealth of information about the right and wrong foods and how to eat healthy for the rest of your like. Also, many tips on exercising. I have never been a big junk food eater, although, I could never loose weitht. I have been able to keep 7 lbs off for several weeks now. I would highly recommend this book. It is full of great tips and teaches you how bad all the extra weight is for your body. If you are looking to EASILY lose weight, then you NEED this book. It tells you how to lose one dress or pant size in 6 days. Sounds too good to be true, right? Well, it's not. You eat SIX meals a day (most of the time I can't eat that much). Every 2 to 3 hours. I lost 4 pounds the first 2 days. I put a couple of friends on this plan and THEY lost at least five pounds in the first 4 days. NOT EVEN EXERCISING!!! This is a MUST HAVE book. Very simple and straight forward. I highly recommend this one!!! This was a great book, but not intended for long term usage. This plan is more for the person who wants to lose between 5-10 lbs. in a short perios of time. If you are looking for a more drastic diet plan, I would recommend the 6 Week Body Makeover.